Differentiate among the various forms of energy. Illustrate three types of energy transfer: radiation, conduction, and convection. Describe different types of energy resources: fossil fuels, solar, geothermal, nuclear, wind, and hydroelectric. Distinguish between renewable and nonrenewable resources in terms of resource conservation. Classify Resources - Click on Resource ID in the yellow Activities box to take a quiz. Natural Resources - Can We Use Them Forever? Renewable Energy vs. Fossil Fuels - Suggestion: create a Pro and Con list for each energy source. That will give you a a way to compare the various energy resources. Renewable Energy Web Links - from the Texas Solar Energy Society (their slogan is "The Solution Comes Up Every Morning!"). Investigate how the sun provides the major source of earth's surface energy. Explore three primary sources of internal energy: gravitational energy from the earth's original formation, friction, and radioactive decay. Diagram and evaluate pathways of energy transfer to demonstrate the law of conservation of energy. The Secret Lives of Energy: Conservation of Energy - scroll down near the bottom, there is an excellent animated image which shows several types of energy changing while total energy remains constant. Describe the energy transfer associated with different geologic events: mantle convection, rock cycle, wind, and ocean currents. Describe the human impact of large scale energy transfer events: hurricanes, photosynthesis, earthquakes, volcanoes, and tsunamis. Compare and contrast alternative energy sources and their environmental impact. 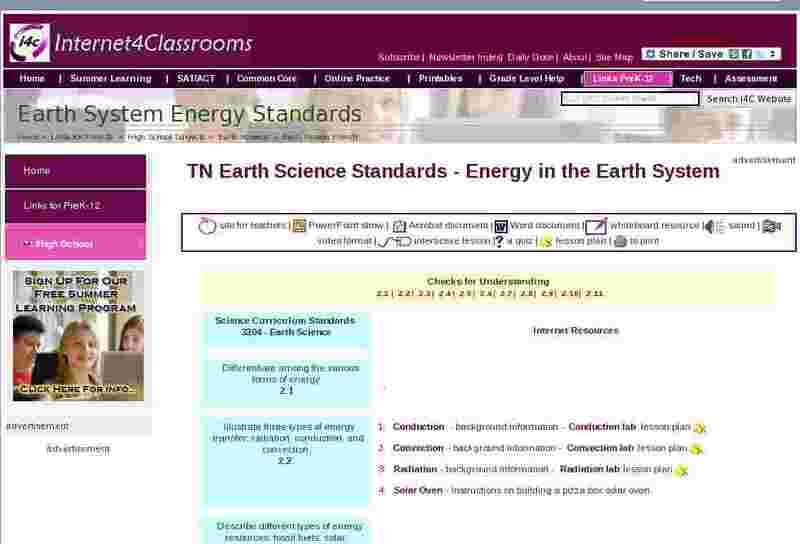 Compare energy sources and heat transfer over geologic time to current patterns of global change.